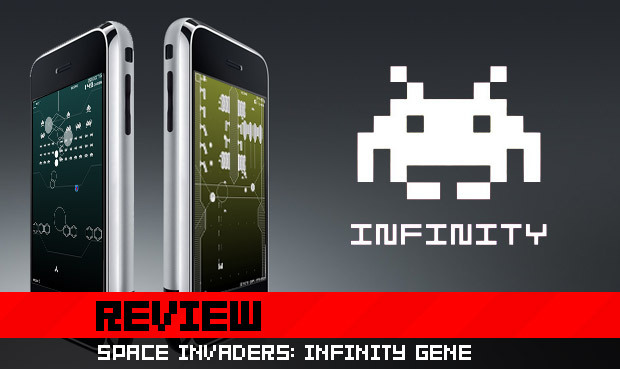 You may have noticed that I've been anticipating Taito's Space Invaders: Infinity Gene pretty heavily since it was first announced for the iPhone. Originally released in Japan on mobile phones that aren't sold anywhere else, I thought this latest installment of one of my favorite classic franchises was one I might never get to play. Thankfully, it's available now in the US and I've finally gotten my hands on it. Nick Chester was kind enough to hand over his iPod Touch for a while to make that possible, and while I've always been somewhat skeptical about these devices as a real gaming platform, all it would take is one great title to change my mind. Was this it? Hit the jump and find out in my full review. Those of you who know me and have just seen the above video will understand that I was immediately interested when I first heard about Infinity Gene. I love space invaders, chiptunes, and shmups, so the three rolled into one already sounded like my cup of tea. I expected to like it. What i didn't expect was for it to be one of the most engaging videogame experiences i've had in years. Sitting down to play this game with a good pair of headphones is not recommended if you're on the subway, bus, or if you've got some responsibility to pay a lick of attention to the world around you. By the time you hit the third level or so, you're sucked in. You boot it up and next thing you know, 45 minutes have gone by and you've forgotten where you were. When it's time to stop playing, you almost have to wake up from it. It certianly looks and sounds like Space Invaders, with all the familiar enemy types and sound effects you've come to love and recognize over the past 30 years. 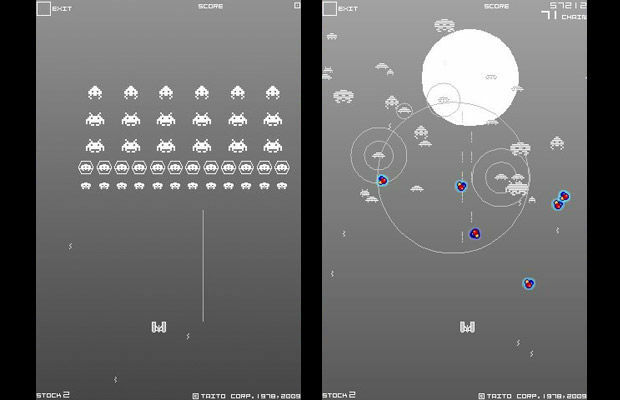 Does it feel like Space Invaders? No, not really. But that's what the Extreme series is for, and you can take your pick from the DS, PSP or XBLA versions if that's what you want. Instead, Infinity Gene feels more like what you'd get if Crisis Force or Radiant Silvergun were available on the Atari 2600. The graphics are sharp, vector-like imagery, and are for the most part monochromatic. Just about everything is white, set against a blue "laser grid" background or a simple color gradient. 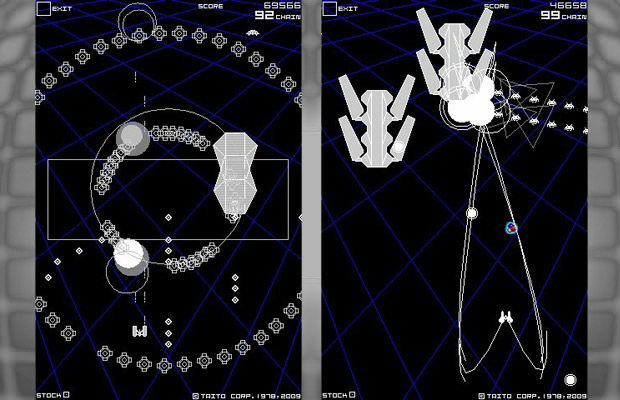 The overall effect is beautiful in its simplicity, and if you have fond memories of anything from Tron, to Rez, to the Star Wars arcade game or in between, you're probably going to love the way it looks. The downside of this mostly single-color aesthetic is that it's sometimes hard to know at first what will kill you and what won't. There are some lines you can fly right through and others that will ruin your day, and it might take a little trial and error before you know for sure which parts of a given level are safe. I do love the look of the monochrome, but there were some areas where I felt a little unclear on where the danger was. Still, the graphics are a treat for the eyes, and visual design choices like fonts and hues fit the game perfectly. 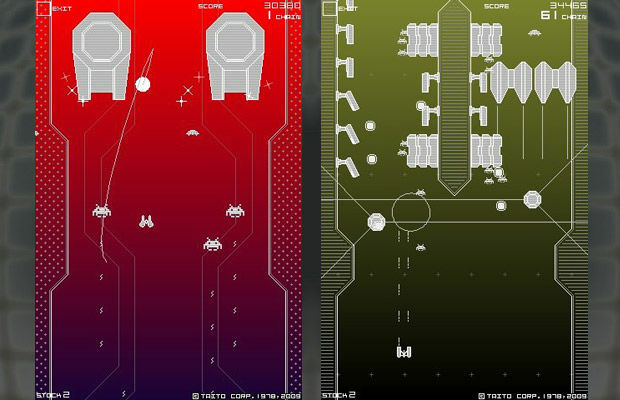 Everything on screen maintains the classic look of Space Invaders while invoking the more modern games it inspired, with very Treasure-esque text, boss warnings and menus. Newly unlocked stages branch out in a tree-like pattern, and which path you take next is entirely up to you. The early ones start out looking like the original classic, and later levels gradually become prettier and more frantic the further you get. Enemies get bigger and more numerous, bosses start poking their way into the mixture, and it's both fun and interesting to watch the game evolve from bare bones "pew pew pew" into a manic, full-fledged shmup, weapon upgrades and all. A popular question regarding the iPhone platform choice is, "doesn't your finger get in the way of the action?" No. No, it doesn't. Control works much like a mouse cursor and a laptop trackpad. 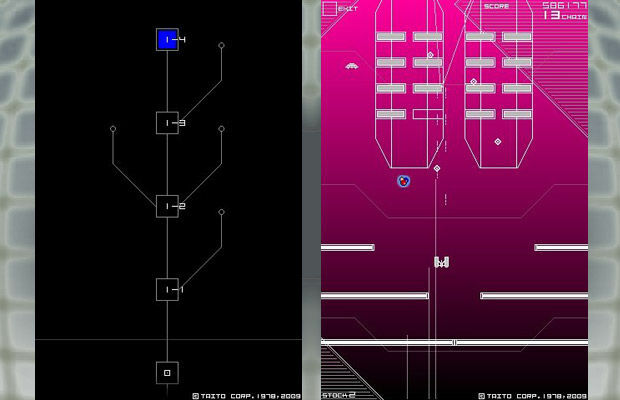 You can place the ship into view and then control its movement from anywhere on the touch screen. It usually works out best to fling it about 1/3 of the way up the playing field and control it from the very bottom, but when things heat up you may want to keep it a bit closer to your finger so you can navigate the madness around you. The levels start out very short -- maybe too short -- but get considerably longer and more involved as you progress. Difficulty, action and overall pacing gradually ramp up as well, and if you take time to play through several stages in one sitting, you really feel like you're getting somewhere. Most are followed up with some unlockable or another upon completion, and the experience on the whole feels very rewarding. Whether you play two stages or ten, you never once feel like you've wasted your time. As was said, the sound effects are classic Space Invaders fare, now set to a fantastic little collection of music. If you enjoy chiptunes, the price tag would still be worth it just to get the soundtrack. But if for some reason you don't, the game features library support, which lets you play exclusive bonus stages backed by whatever songs you have stored on your iPhone. As cool as that feature is, I doubt many people will be using it, because as I said, the music is good. Really good. The tempo picks up in all the right places and sometimes makes it hard not to nod your head and make an idiot of yourself in front of whoever happens to be nearby. It matches the gameplay to the letter, and makes you never want to put down your iPhone -- a platform that I'm altogether stunned to see such a quality game on. All that for the price of a drink at Starbucks? Not bad. The visuals, music and gameplay are all stellar on their own, and when you put them all together as one experience, the end result is something I would have easily paid much more for. If you have an iPhone, you'd be crazy not to pick this up, and for $4.99 you'll get a hell of a lot more out of it than you would that frappuccino.